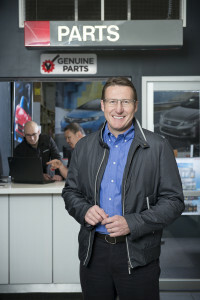 Australian racing champion Mark Skaife has been appointed ambassador to the “Genuine Is Best” new OEM parts campaign, the campaign and the Federal Chamber of Automotive Industries announced Monday. “So if your vehicle needs repairs after an accident or even if it’s just a service, it’s crucial that genuine parts are used to ensure your vehicle operates the way it was intended. “He’s a well-known and trusted authority on automotive safety and this makes him ideal for the role as Genuine Is Best ambassador,” Berry wrote, earlier noting that Skaife had worked on V8 Supercar vehicle safety and track design. Asked about if Skaife was a paid or volunteer spokesman, Berry wrote that the campaign couldn’t discuss the specifics of the partnership. “However we approached Mark to front the campaign and found that he too was very passionate on this subject, and was therefore a natural fit to be our ambassador,” Berry wrote. Berry wrote that no ads featuring Skaife were planned, but “nothing is off the table.” For now, Skaife will talk to the media and public about OEM and official Opt-OE parts. “Mark is passionate about the importance of using genuine parts – he see it as a serious safety issue – and his aim is to help educate consumers about how crucial the use of genuine parts are in repairs and services,” Berry wrote. In June, the FCAI announced the launch of the Genuine Is Best website promoting OEM or official Opt-OE parts to Australian consumers. The biggest reaction has been from the country’s repairer community, Berry wrote.